Obstructive sleep apnea (OSA) is the most common sleep-related breathing disorder and is associated with significant morbidity. We sought to present an updated systematic review of the literature on the accuracy of screening questionnaires for OSA against polysomnography (PSG) as the reference test. Using the main databases (including Medline, Cochrane Database of Systematic Reviews and Scopus) we used a combination of relevant keywords to filter studies published between January 2010 and April 2017. Population-based studies evaluating the accuracy of screening questionnaires for OSA against PSG were included in the review. Thirty-nine studies comprising 18 068 subjects were included. Four screening questionnaires for OSA had been validated in selected studies including the Berlin questionnaire (BQ), STOP-Bang Questionnaire (SBQ), STOP Questionnaire (SQ), and Epworth Sleepiness Scale (ESS). The sensitivity of SBQ in detecting mild (apnea-hypopnea index (AHI) ≥ 5 events/hour) and severe (AHI ≥ 30 events/hour) OSA was higher compared to other screening questionnaires (range from 81.08% to 97.55% and 69.2% to 98.7%, respectively). However, SQ had the highest sensitivity in predicting moderate OSA (AHI ≥ 15 events/hour; range = 41.3% to 100%). SQ and SBQ are reliable tools for screening OSA among sleep clinic patients. Although further validation studies on the screening abilities of these questionnaires on general populations are required. Keywords: Obstructive Sleep Apnea; Surveys and Questionnaires; Validation; Sensitivity. 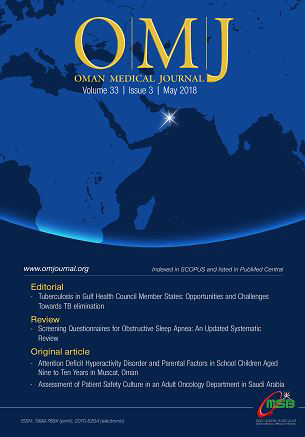 Keywords: Attention Deficit Hyperactivity Disorder; Prevalence; Risk Factors; Demographic Factors; Oman. Keywords: Safety Culture; Surveys; Saudi Arabia. Keywords: Lithotripsy; Extracorporeal Shockwave Therapy. Keywords: Urinary Tract Infections; Escherichia coli; Antibiotic Resistance; Integrons; Extended-Spectrum Beta-lactamases. Keywords: Tobacco Smoking; Mental Disorders; Schizophrenia; Oman. Objectives: We sought to evaluate the effect of night shift working on increasing the risk of developing cardiovascular disease (CVD) using three different predictors. Methods: One hundred and forty adult Jordanian employees were recruited in this cross-sectional study. Demographic data, anthropometric parameters, and working patterns information were documented. Metabolic syndrome (MetS) was diagnosed, and atherogenic index of the plasma (AIP) and Framingham risk score were calculated. Results: Night shift workers had a significantly higher AIP ratio compared to daytime workers (p = 0.024). No significant association was observed between the two groups in term of 30-year Framingham risk score (p = 0.115). However, the duration of night shifts and the number of night shifts per months were found to significantly increase the 30-year Framingham risk (p = 0.000 and 0.012, respectively). Furthermore, the incidence of MetS among night shift workers was 15.9% (13/82) compared to 10.3% (6/58) among daytime workers (p = 0.484). Conclusions: This is the first study to assess the association between night shift work and AIP as well as the 30-year Framingham risk score as predictors of CVDs. Night shift work was associated with an increase in AIP score compared to daytime work. Also, the duration of night shifts and the number of night shifts per month significantly increased the 30-year Framingham risk among night shift workers. These findings suggest an association between night shift work and the risk of CVD and atherosclerosis. Our results highlight the need for interventional strategies to diminish the risk of CVD in night shift workers. Keywords: Night Shift Work; Cardiovascular Diseases; Metabolic Syndrome; Risk; Jordan. Keywords: Abattoirs; Cephalosporinase; Antibiotic Resistance; Escherichia coli; FOX-1 genes; Multidrug Resistance Bacteria; Nigeria. Keywords: Inflammatory Myofibroblastic Tumor; Appendix; Appendicitis. Keywords: Polyarteritis Nodosa; Vasculitis; Polyneuropathies; Cyclophosphamide. Pneumorrhachis with Spontaneous Pneumomediastinum: Should It Raise Special Concerns? Spontaneous pneumomediastinum (SPM) is a rare and benign condition predominantly seen in young males. Patients present with non-specific pleuritic chest pain, cough, and dyspnea. Hence, it is difficult to diagnose in the acute setting until other serious differential diagnoses involving the integrity of the aerodigestive tract have been excluded. This results in over investigation and overtreatment until a diagnosis has been confirmed. We report a case of a 21-year-old Omani female who presented with a complaint of cough. She was diagnosed based on clinical and radiological findings after exclusion of hollow viscous perforation to have SPM extending to the spinal canal (pneumorrhachis). Her condition improved following conservative management, and she was sent home after three days. Keywords: Pneumorrhachis; Pneumomediastinum; Mediastinal Emphysema. Keywords: Hemangioma, Intraosseous; Ulna; Tumors.